Federal agencies have developed “open government plans” in response to an early directive by President Obama. The plans of top agencies have been assessed by both the government and advocacy groups to see if they met the requirements laid out in the directives, often with an emphasis on the degree to which they increase transparency. This report focuses on how well these agency plans increase public participation and collaboration. 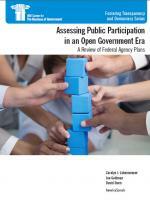 The report provides details of best practices being applied by federal agencies in engaging the public on-line, face-to-face, and through formal mechanisms, as well as what agencies are doing to change their cultures to support greater participation by the public. It also offers a series of specific recommendations for what next steps the White House and agencies might take to spread these best practices across the government. Read the Federal Times article about this report.